There are high and lo-tech ways of tracking your progress in your knitting. 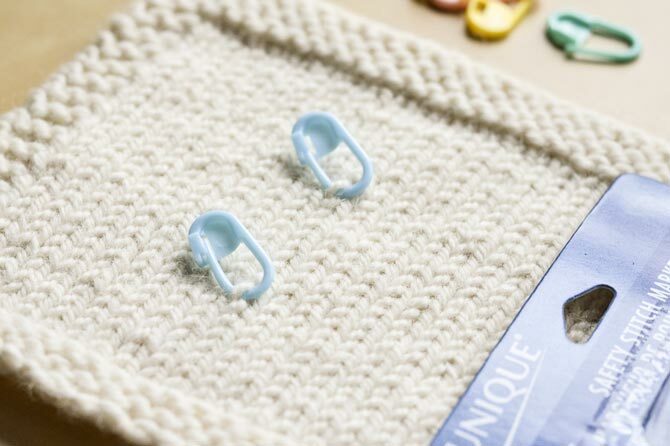 Use stitch markers to visually count your rows or stitch pattern repeats. Many projects involve different kinds of steps. For example, you might need to work a decrease every 10th row, or count the number of rows before changing to a different color of yarn. It makes life so much easier if you can do this counting as you go. One tool we looked at yesterday is stitch markers, which might be my favorite knitting tool ever. If you have enough of them, you can use them as counting tools by hooking one into your knitting every 10th row, as pictured above, (or 20th, or however often you need). That way, when you return to your knitting you’ll be able to look at it at a glance and count the stitch markers, and know quickly how many rows you have worked. 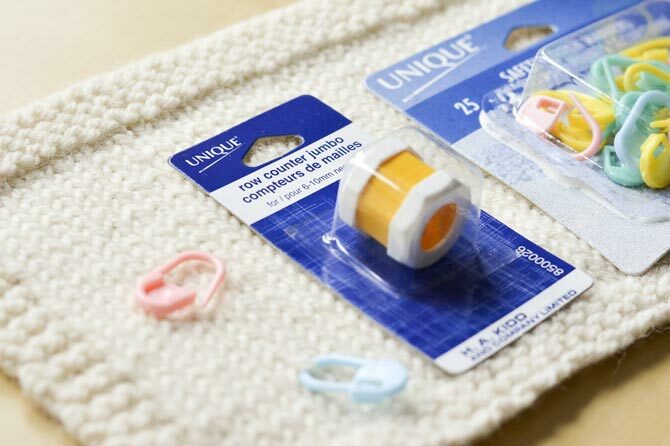 You can also hook the stitch marker at the exact place you’ve made a decrease, which might be easier to keep track of if you’re knitting with darker colored yarn. Another handy gadget is the row counter, which comes in different sizes and styles depending on your needle size and needle style. This one is sized for larger needles, and sits on the very end of a straight needle. Once you get to the end of a row, you turn the dials at the side and the number will change. You can see from my row counter that I have knitted 3 rows so far! 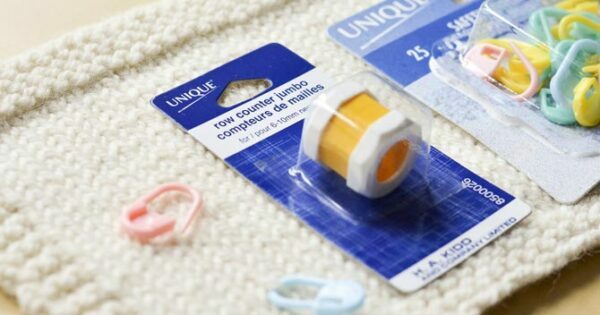 You can also find them for circular needles, which are made with a loop to hang off of the circular needle cable. 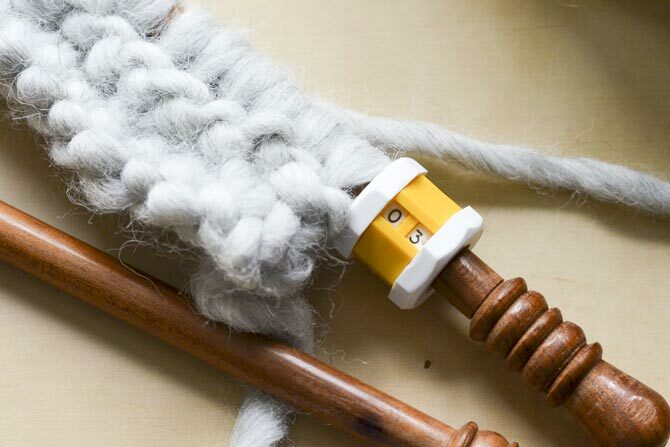 Use a handy row counter to track how much you’ve knitted. There are other “low tech” methods to track your progress, like making tick marks with a pen in the margin of your pattern, or counting out 10 potato chips and letting yourself eat a potato chip for every row you finish. (That one could get dangerous!) The biggest challenge with any of these methods is simply to remember to do it! If you’re using a snazzy row counter, you need to remember to change the dial on the row counter before starting the next row! So, we all do our best. Tracking your knitting progress gets easier with time, and with whatever method you find easiest to stick with!